Fall XC Race at C.O.P. I’ve been waiting for something like this for a while in Calgary, and finally it looks like my dream may be coming true. 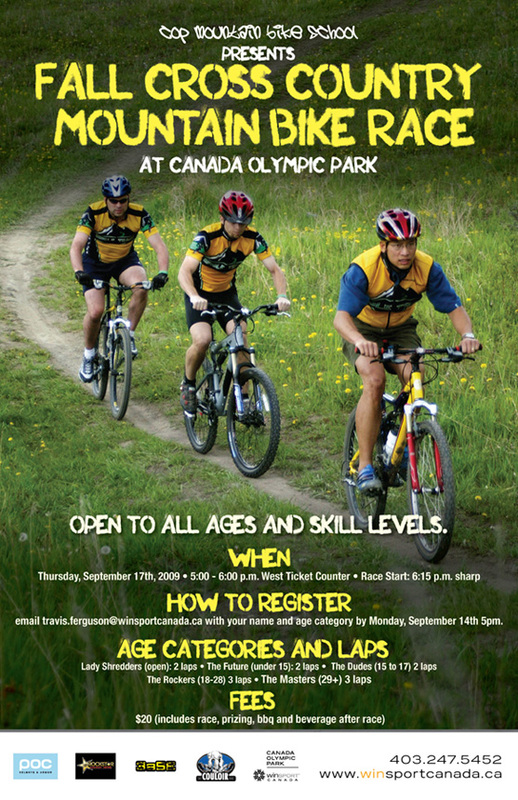 WinSport Canada is hoping starting a weekly drop-in cross-country race at C.O.P. and using this September race to guage interest. Let’s get out there, support the cause and help get something going… It’s local, it’s going to be fun, there’s going to be food and bevies, and heck, I’m going to be there, what else do you need!? September 17th @ 6:00, be there! Looks like there’s going to be a great turnout! So far there are 48 racers registered with 18 women! I’m sure if there were a few extras on race day no one would complain!